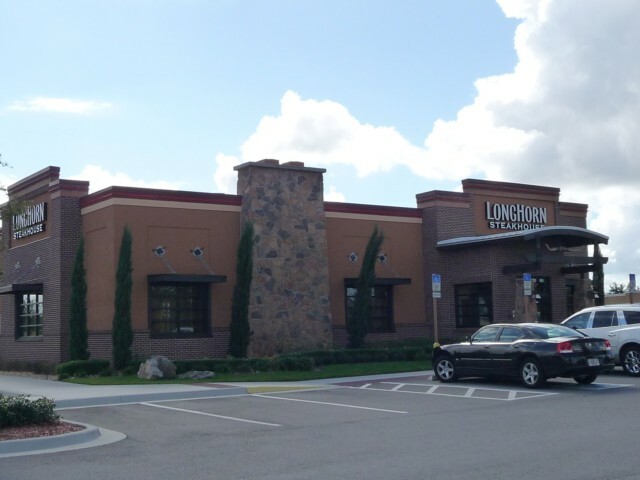 We were introduced to Longhorns Steakhouse on our first visit to Florida several years ago and we now make sure that we pay at least one visit to this excellent restaurant each time we visit our villa. If you like steak (and you have to if you visit Florida) you will be in heaven. I have never tasted such good steaks anywhere in the world. Once inside you could imagine that you were in the middle of Texas cow country rather than commercialised Orlando. The décor is rustic with animal heads and other artefacts around the walls. You will normally have a short wait as Longhorns is very popular so it is nice to have a drink at the bar on the high stools while you wait for your table. You will not usually have to wait longer than 20 minutes but it is always busier at the weekends and on Fridays. The first thing to arrive at your table is the most delicious freshly baked bread which is served on a wooden board with soft butter which just melts on the bread – amazing! For starters I can highly recommend the Texas cheese fries – which are fries covered with a spicy mince and melted four cheese topping. Beware though, the portions are huge and we shared ours between four and there was ample considering that this only to start and there is much more to follow. For the main course there are, naturally, a vast number of steaks to choose from. The renegade is a popular choice but the New York strip is always good but my particular favourite is the sirloin, all steaks come in different weights according to your appetite. They are best served medium rare as you can always ask for it to be cooked further whereas if it is over cooked there is no other option. Also there are other choices on offer if you are not a red meat lover such as fish and chicken. There are various potato choices and also side orders if you have a big appetite. The main course as is usual in most restaurants in Florida, comes with a salad plus a choice of several dressings. If you have room for dessert you are in for a treat – they are enormous. It is probably best to order one and ask for extra spoons. We can thoroughly recommend Longhorns as it is one of our favourites now and I’m sure it will become one or yours too. Viewed 3008 times since 8 January 2010.